Editor’s note: This post was written by Rafay, an entrepreneur, computer scientist, and professional ghostwriter for several high-traffic websites. He provides byline and ghostwriting services for digital and brick-and-mortar businesses with a focus on web development, WordPress, and entrepreneurship. You can find him on Twitter and Google Plus. A whole new class of next-generation design tools is taking prototyping and design to the next level. The web has been evolving for nearly two decades now but we haven’t seen two decades worth of improvement in web design tools. As web design trends change the design game, the demand for new design tools continues to increase. Because web design has changed, the tools for web design have to change too. I’ll be your guide to the world of next generation web design tools and walk you through an exploratory assessment of each. The concept behind web design has always been to create beautiful design and to not have to worry about tiny coding details and other back-end intricacies. All of this is possible now. The next-gen web design tools that we’ll be talking about in this post improve on user interface designs and user experience designs to a degree that was unimaginable a few years ago. Sketch is a lightweight web design tool that gives users power, flexibility and speed to produce better results. The tool is designed for Mac and it leverages its exclusive features: Retina, Quartz, Auto Save and Versions. Reusing elements in designing is inevitable in web design. Sketch makes it easier for designers to reuse elements by integrating symbols and shared styles features. Multiple pages and artboards makes designing an efficient and timesaving task altogether. Sketch’s fully vector-based workflow saves designers from getting into web development. The web design tool offers vector Boolean operations which allow web designers to create complex shapes while fully utilizing layer styles. Let’s sum up the features Sketch provides. Sketch packs a ton of powerful features into one web design tool and is widely used by professional developers in Apple and Google. If it’s good enough for these two, then it should be good enough for your web designing needs too. Bohemian Coding offers customers excellent support and documentation. You can get a license for $99 on their website. Being a web designer, you’ve probably heard of Macaw and its ever-enticing tagline “Stop writing code, start drawing it.” If you’re anything like me, it must have gotten you pretty excited about what it features (and if it’s even possible). Let me start off with some good news: their tagline is absolutely spot-on. Macaw is all about letting web designers focus entirely on designing by giving them the comfort and familiarity of a flexible image editor environment and writing HTML and CSS for them automatically in the back-end. This next-gen web design tool uses the Stream real-time layout engine to allow for easy image handling. Stream takes care of the mathematical calculations which save designers from having to enter a battlefield with layouts. The magic behind Macaw is that it accomplishes something most people thought was impossible – it translates design into HTML and CSS. The design-to-code engine, Alchemy, is responsible for this incredible madness that leads designers to accidently write code they never thought they could. Let’s take a look at the features it offers. Whether you’re a professional web designer or are just starting out, Macaw will save you the trouble of learning to code in HTML and CSS. Don’t let your ability to design fall behind just because you can’t write code. Let Macaw’s Stream engine do the calculations while Alchemy writes beautiful, usable code for your designs. Try out the free trial or purchase their $79 license for both Mac OSX and Windows. 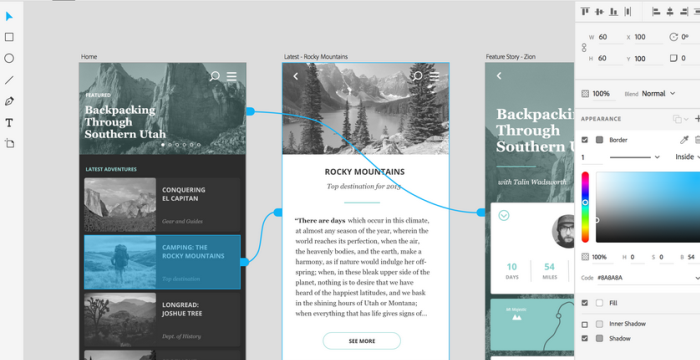 Project Comet is part of Adobe Creative Cloud, a new tool for designing and prototyping user experiences. It is a next-gen design tool that merges visual design, wire framing, prototyping and previewing in one super-application. The only drawback: its preview release is scheduled for 2016. The way you perceive your work has changed– responsive designs and interactive elements need to be addressed as real problems faced by user experience (UX) design. Project Comet tackles the challenges faced by UX design and scales seamlessly with larger, more complex projects. The goal behind Project Comet is to minimize the friction that comes from using several tools for designing and prototyping. Project Comet uses the latest hardware compositing techniques and rendering technology that keeps getting better and better. Adobe’s CreativeSync technology makes it possible for users to bring their Illustrator or Photoshop assets by importing them to Comet directly. Indeed there are many benefits to being a loyal Adobe user. Let’s look at the features Project Comet will offer. Like all Adobe products, Project Comet doesn’t require you to be an expert designer to be able to use it. Keep an eye out for its release and get a hands-on experience with this next-gen web design tool when it comes out next year. In this article, we introduced you to the next generation of web design tools and addressed the current web design issues they tackle. We encourage you to experiment with them on different projects to see for yourself how they’ve changed (and continue to change) the design game forever. The paradigm shift in web design tools is revolutionary and it has brought out some of the best (long-awaited) tools that we’ve ever seen. Our list of the 7 Best Tools for Web Designers in 2015 is also worth a read. 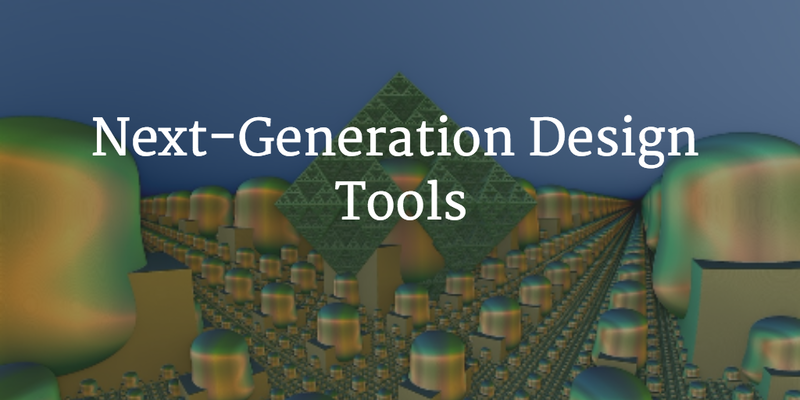 Which next-gen design tools do you use? What do you like best about next-gen design tools? Let us know in the comments section below.